Three years ago today, I posted my very first recipe on this blog. What started as a creative outlet to share my knowledge of nutrition and vegan recipes, has turned into something greater than I could have ever anticipated. I’ve found something I truly love doing – sharing with you! I have become connected with some of the most amazing people passionate about food, health, fitness, business and community. I’ve met other ladies doing this crazy food blogging thing and they are some of the sweetest and most driven people I’ve ever met. Thank you to everyone who has encouraged me along the way, and especially you, my readers. I am indebted to everyone who has left comments or made a recipe – thank you for being a part of this! I am so grateful to each and every person who has come alongside me on this journey. I’m bursting with ideas of new things to do and try. Though I haven’t been posting regularly, things are about to change! I have big plans in store. I also want to thank you all for the overwhelming response from my last post. Your kind and supportive words mean the world to me during this time of healing. I will get you up to speed on my recovery in a future post. Today I’m sharing with you a salad. Since the first recipe I shared with you was a salad, I thought it would be fitting to celebrate this anniversary with Spring fare. 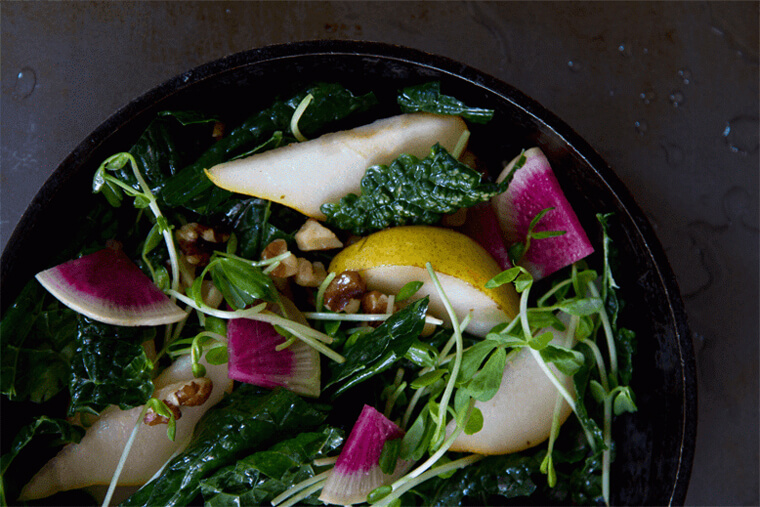 This is not just any ole salad, but a Kale Salad with Watermelon Radish and Pear! Back in early March, my sister and I went home to Iowa to meet our new nephew, who very well could be the cutest little fella around. When we weren’t snuggling with the baby or oohing over his every move, we were eating. After visiting the local natural food store, I tossed this beauty together. It was a big hit! 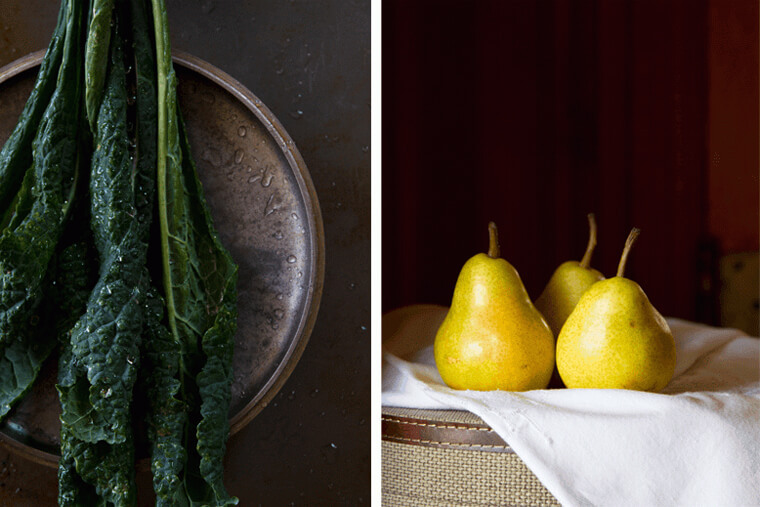 Look forward to many more recipes coming your way from this photoshoot session! Massage kale with olive oil until leaves soften. Toss all ingredients into a bowl to combine and finish off with a dash of pepper. This summer, NYC is bringing the heat. It has been a hot, humid summer tempered only by an occasional thunderstorm and lots of cold watermelon. With all this sticky humidity, I have to remind myself of all of the great things that the summer brings: farmer’s markets, long days of sunshine, flowers, roof top parties, afternoons spent at the pool, ice pops. To celebrate summer I made a raw soup. 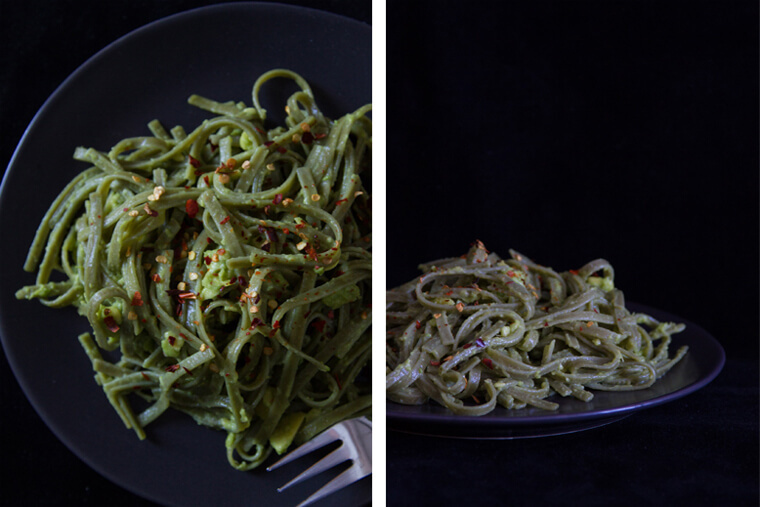 It combines two summertime favorites – avocado and cucumber. 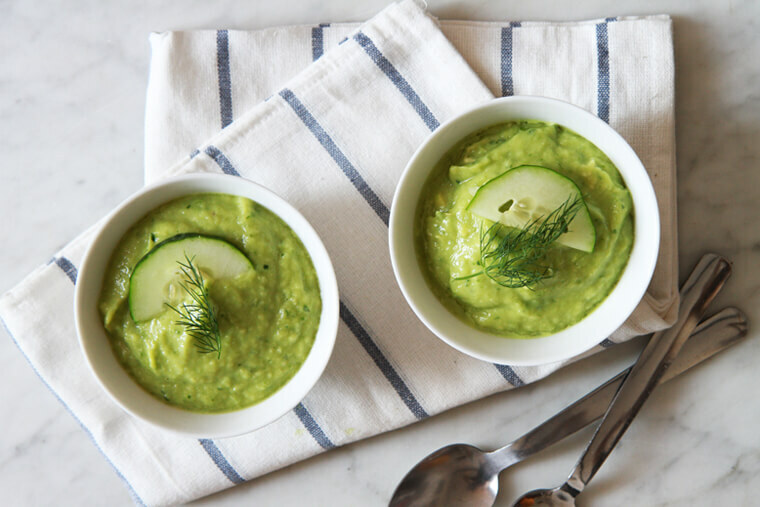 This refreshing, delicate soup is a perfect pairing to a sunny day. 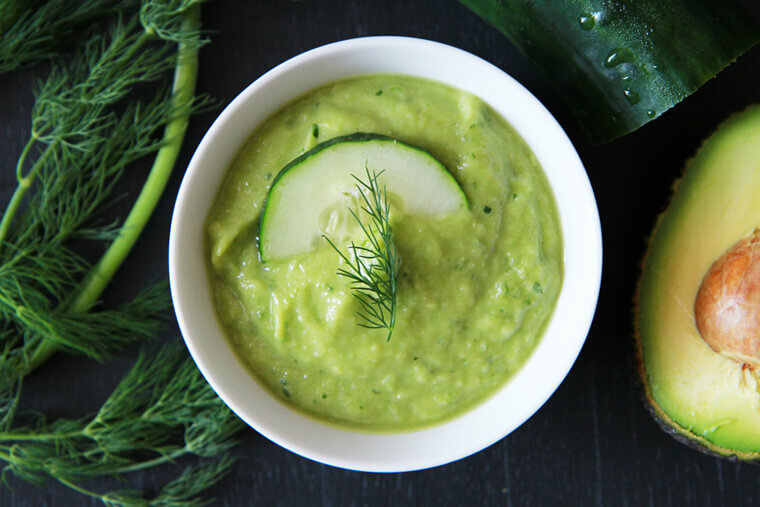 Combine cucumbers, avocado, garlic, lime and salt in a food processor or powerful blender and blend until totally creamy and smooth. Chill 30 minutes before serving and top with dill to garnish. Phew! It has been a wild couple of months over here and I am just coming up for breath. Highlights include: a couple of trips out of town (and out of the country), starting a new job, working hard on some new projects and some of fall’s finest bounty. It is shaping up to be a great year for fresh produce. I had an apple picking adventure a few weeks back, which means you should keep your eyes peeled for lots and lots of apple recipes around these parts. 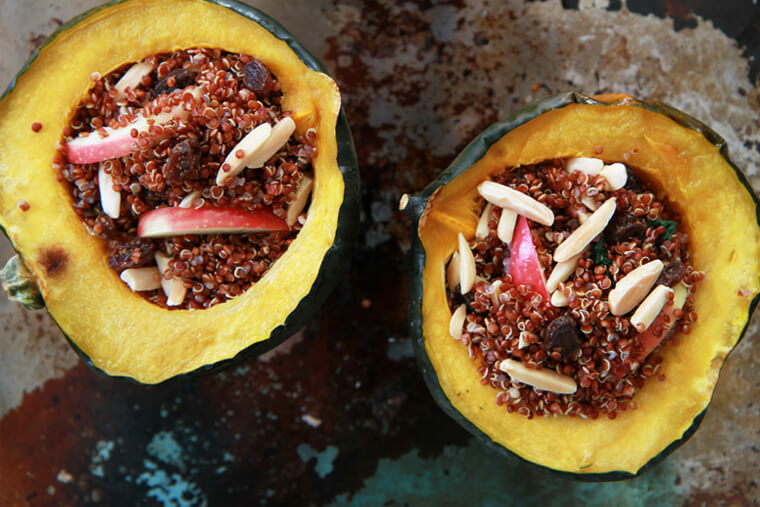 In the meantime, feast your eyes on this simple and healthy creation. Preheat oven to 400°F (204°C). Slice squash in half, scrape out seeds and strings. Brush squash with 1/2 tablespoon oil and season with salt and pepper. Roast cut side down on a baking sheet until tender – 15 to 20 minutes. Meanwhile, bring quinoa and 1 cup water to a boil in a small pot. Reduce heat and simmer, covered, until tender and water is absorbed, about 15 minutes. Let cool, then fluff with a fork. 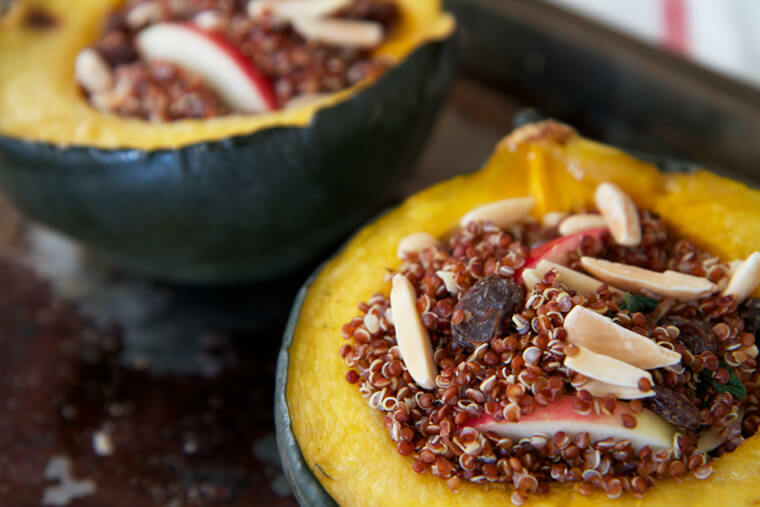 In a large bowl combine quinoa, apple, kale, raisins, almonds, remaining 1/2 tablespoon oil and mix. Season with salt and red-pepper flakes. Divide filling among squash. If your heart so desires, drizzle a little maple syrup over the top.